Untitled, detail of artwork by Dhanashree Gadiyar. Photo courtesy of Sarah Goodchild Robb. The launch party for LegalEase, a joint venture for immigration attorneys Angela Antonia Torregoza and Amir Rasoulpour, was an art opening called ImmiGreat: Immigrants Enrich American Communities at The Local NYC in Long Island City. The show features artworks celebrating the positive contributions immigrants make in culture and communities in this country. The show is curated by Mai Kikuchi-Torregoza and Hannah McHale. It opened on January 19 and runs until the end of the month. Dhanashree Gadiyar, originally from India and living and working in NYC, identifies as a storyteller and her works often share the stories of other immigrants: their hopes, fears, and, in many cases, their feelings of alienation and loneliness. Paper, gold leaf, and cut-out quotations borrowed from the interviews she conducts are common materials she employs. Although she works with individual examples, exploring and sharing personal and intimate insight into the experiences of her subjects, what emerges are more universal and identifiable themes. Untitled, a two-panel work photographed above, likewise follows this investigation. 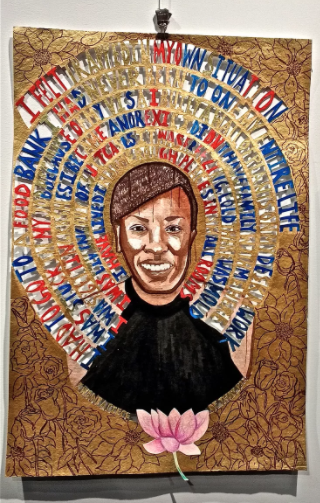 It differs from past projects, however, in that she composes an actual portrait of her subject along with her more traditional use of text and symbols. To read the full article, please go to Sarah's blog here. Follow us on Instagram, Twitter, Facebook, LinkedIn or Tumblr for up-to-date immigration news.